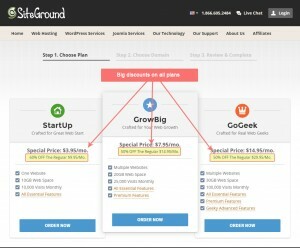 Reader Asks: Do you recommend SiteGround? A reader recently asked me if I recommended SiteGround who I use to host Adventures with Poopsie. She also asked me to write a post about it, so here it is. When I first decided to start a blog, I simply signed up for a free WordPress account. This was great and it did everything I needed, but it bothered me that I didn’t have my own domain name. I enjoyed visiting sites like Mr. Money Mustache and Frugalwoods, typing in their domain name without the pesky .wordpress after it. So I decided I was going to buy my domain name and went about finding out how to do it. At the time I was enthusiastically reading Bren on the Road’s excellent blog and I sent him a tweet asking him who he used to host his website. He sent back a speedy reply and told me he used SiteGround. I mentioned this to Poopsie and we decided to mull it over for a few days. 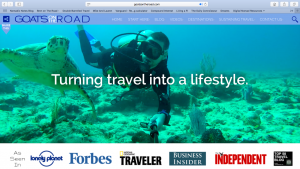 I then came across this great post from Goats on the Road who again recommended SiteGround. Two recommendations from two awesome blogs was good enough for Poopsie and I, and we quickly signed up. We went straight over to the SiteGround website and set up an account. There are three plans to choose from. We signed up for the “Start Up” Plan, but you may want to select a different one. The information on the benefits of each is quite clear, so be sure to find the best one that suits you. SiteGround also regularly run specials and you can often get your plan for a reduced rate. As I already had a WordPress account, SiteGround were able to transfer all of these posts over to my new domain. This was done in less than 24 hours and everything, including my WordPress theme and all of the images I’d posted came over smoothly. I then commenced blogging. I find the SiteGround dashboard and website very easy to use, and as I was using a WordPress blogging platform, it was all familiar to me. Last week, I decided to change my theme, as the previous one I was using no longer suited my website. I did all this reasonably seamlessly (with the occasional help of Google and YouTube) and saved my changes. For the next 24 hours, I was unable to access my site. I didn’t realise my site was inaccessible until the following morning and, assuming it was an issue with the internet, I went to work. When I got home, I still couldn’t access the site. With very little technical or internet related skills, I had no idea what to do. I logged onto SiteGround and accessed their Live Chat function. I chatted with the excellent Dani and she soon got to the bottom of my issues and solved it immediately. From the time Dani identified my issue to the time I was able to access my site again was less than ten minutes. I haven’t used any other hosting services before, so I can’t compare SiteGround to them. What I can say, is they have been an excellent hosting service for me thus far. The sign up and transfer of my WordPress blog was done very quickly and efficiently. The Live Chat function is excellent and my problem was solved very quickly. I am confident that SiteGround will fix any future issues I have. Some of the links to SiteGround throughout this post are affiliate links. What this means is, if you click on this link and sign up to SiteGround, I will receive a small commission that will help me to keep Adventures with Poopsie on the internet. The price to you does not change. However, I can assure you that I would never recommend a product or service on my blog that I hadn’t used myself and that I didn’t genuinely find excellent. If you are looking to start a blog, I highly recommend you use SiteGround to host. In my opinion, they’re fantastic. Have you ever used a web hosting service? Who do you recommend? 1 Response to Reader Asks: Do you recommend SiteGround? Sorry for the late reply! When I started investigating, Bluehost seems to have a lot of web presence, but when I went looking at all of the bloggers I read, it appeared that not many of them used it. Your experience with Siteground support (especially given time differences for us in Aus) is a big plus. The post has been very helpful, thank you.